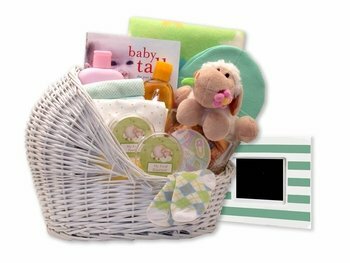 This is one of our popular, quick ship baskets that is a great choice whether a boy or girl is on the way, or when the gender is not known. Available in pink, blue, or gender-neutral teal accent (as shown). If order is received on a business day by noon Central time, we will ship on the same day. If received on a weekend or holiday, or after noon on a working day, we ship your gift the next business day. Click on More Images to see the pink and blue versions. A collection of useful and thoughtful gifts with a focus on Baby's Firsts - a "first piggy bank" and "first tooth fairy box," for example - are assembled in a basket shaped like a little bassinet. Basket measures approximately 15 by 13 inches. Please choose pink, blue, or neutral (teal) when ordering. Little Lamb "My First Bank"
Johnson’s Baby Bath 8 oz. Johnson’s Baby Shampoo 8 oz. Johnson’s Baby Lotion 8 oz. Makes a lovely presentation at a shower and is a perfect gift to welcome the little one home from the hospital. Free shipping in the Continental U.S. is included. Note: Plush toy, baby towels, blankets, and clothing designs can vary and may not all be identical to the photo. This was a perfect gift for my co-worker's baby shower. She asked for neutral gender gifts because they wanted to wait until the baby was born before knowing what is was. This basket looked really cute on the table at the shower and it really does have a lot of great stuff in it. The parents were really happy with this basket! The cute bassinet shape and all the necessary baby items made this gift stand out at the party and they couldn't believe how much was packed into it. They loved it and so did everybody else. Great job!